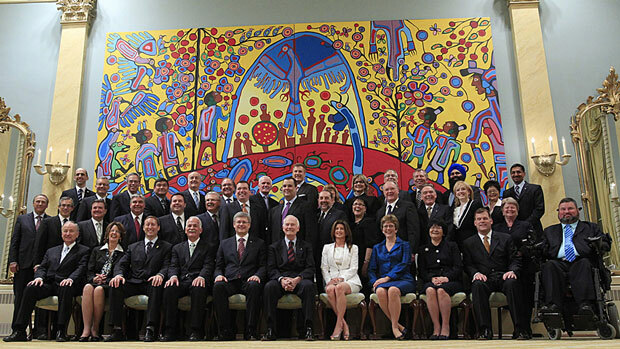 The Twain Shall Meet: Meet the First Harperland Cabinet ~ A Simple Photo Opportunity? Meet the First Harperland Cabinet ~ A Simple Photo Opportunity? Mark My Words Folks, the next four years are ^NOT going to be good years for this country. Not on your life. Late last year, back in Canada, when it was announced that the name of the government was being changed, I was against formally calling 'The Government of Canada', "The Harper Government" and made myself heard on the subject But this new twist, this strange new twist, has me thinking that I would be very much in favour of renaming this Great Country, so long known as the Dominion of Canada, to the more appropriate "Harperland". 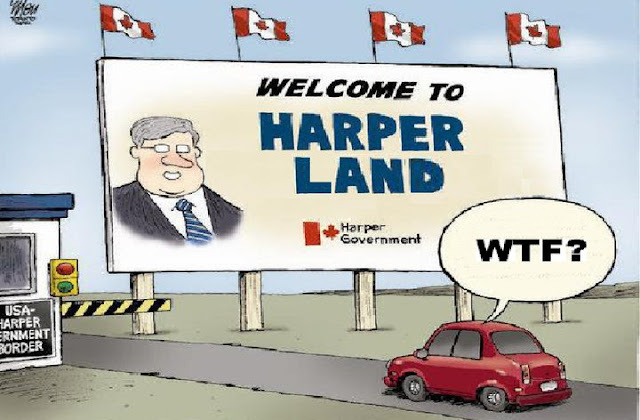 Welcome fellow Harperlanders (it's OK you'll get used to it) to the first few days of a Harper Majority. Hold onto your hats, hide the silverware, and remember: Take ^Notes. No, I haven't completely lost it, ( just yet) but I want it to be easy to keep this four and a half years separate from the first one hundred thirty four years of Canada's proud history, at least in people minds. I want everyone to know that this is ^NOT the Canada of Diefenbaker. This is not the Canada of; Pearson, Trudeau, Clark, Campbell, Mulroney, Chretien, Stanfield, Martin and this is not the Canada of the "Minority Harper Government". No, this is a brand new entity. This is ^NOT Canada as I recognize it. Neither am I suggesting that we forget the lessons learned during the Minority Harper Government, as it is obvious that these lessons were never really learned. The information is still there though, and even the over zealous Stephen Harper will ^NOT be able to hide it. He will however, double, re-double and again re-double his grip on Harperland and most of that in the next 100 days. I will be doing my best to chronical at least some of this huge undertaking. I have just got to admit that I see pure metaphor in the image behind this group of Harperland's Founders. In this beautiful bewitching painting (see below for details) the local people are gathering, coming from all directions, from far and wide, their mouths agape, their innocent faces turned upward, on an up hill climb, staring awestruck at the huge figure of a big blue Bird, who is itself being seemingly adored by another closer, darker group. Am I reading too much into it? I sure hope so. So, Keep busy, Stay awake, Take notes, Hide the silverware. I'll be back! But, Before I go, I want to reassure you that although I have no real faith in Harper or anyone in his cabinet, I am aware that there are still real heros in the world. And that brings me back full circle to the Painting behind the man behind the curtain! This painting was done by a man who never set foot in Harper land. He spent his entire life as a Canadian and he was a beautiful Canadian. He was an amazing painter. Seriously, I'll be back. thanks.